The kids today don’t know they’re born; more specifically the music making kids of today don’t know they’re born. Modern computer systems and even mobile phones are capable of producing professional grade audio with ease using applications such as Propellerheads Reason, Caustic or Apple GarageBand. 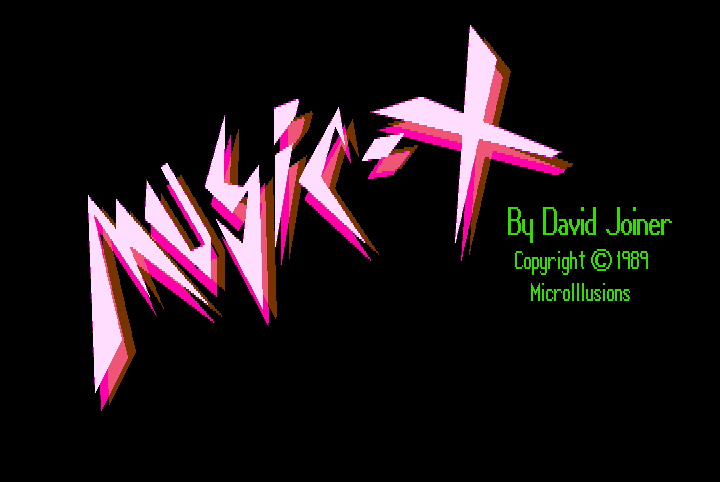 In 1989 it was a very different story, back then Music-X was the cutting edge music studio on the Commodore Amiga. To load Music-X double click the Walkman. Music-X was written by David Joiner and released in 1989 by MicroIllusions. It offered the ability to sequence musical notes and send then via MIDI to external synthesisers. 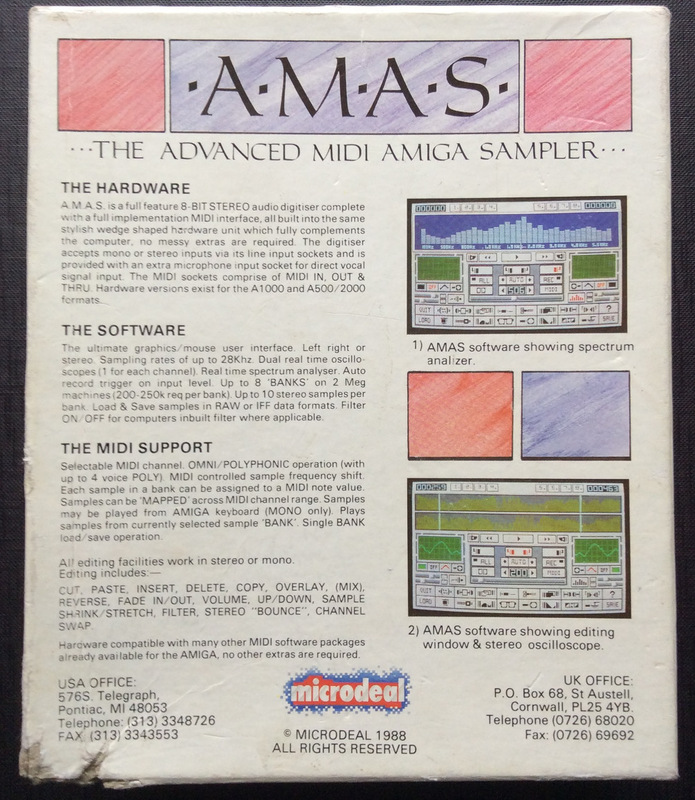 It wasn’t just restricted to MIDI though, it also allowed you to utilise the Amiga’s internal sound chip which for reasons known only to them Commodore decided to name Paula. 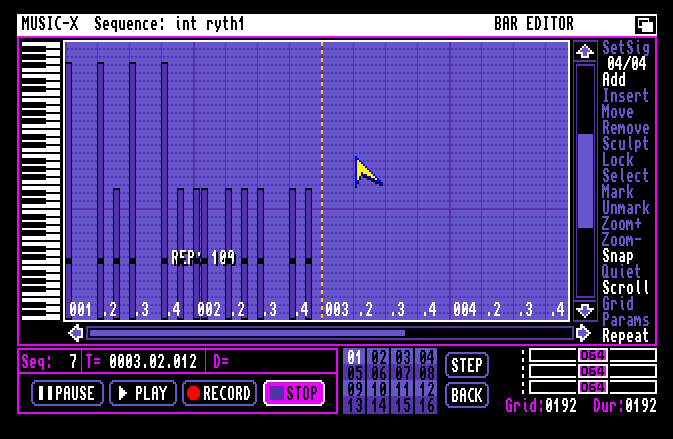 This allowed you to add four mono or two stereo 8 bit samples to accompany your MIDI compositions. The back of the AMAS box. 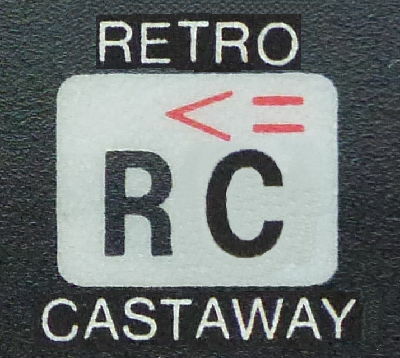 In order to transmit MIDI the Amiga, unlike it’s rival the Atari ST, required an external MIDI interface. 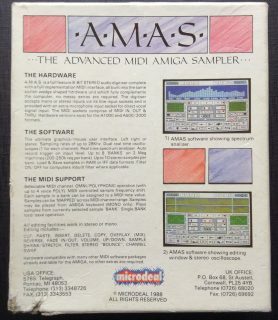 A popular interface of the time was AMAS, the Advanced MIDI Amiga Sampler. 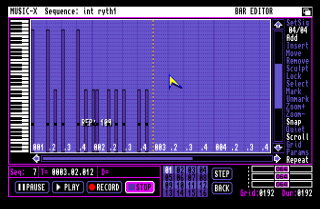 This unit allowed you to not only transmit MIDI but also create and manipulate your own samples to play on the Amiga’s internal Paula chip. Combining Music-X and AMAS provided an affordable but powerful music studio by the standards of the day, all you needed to do was plug in your synthesisers and the musical sky was the limit. 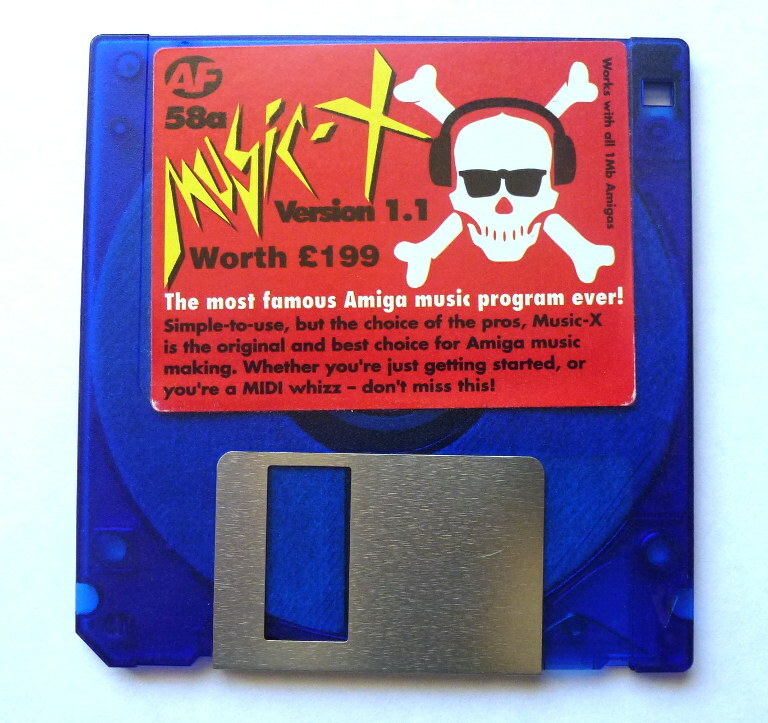 Music-X given away free with Amiga Format in April 1994. 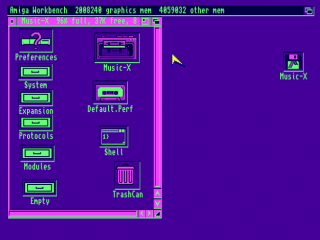 We thought we’d fire up Music-X once again using an Amiga emulator on our PC. To do this we got hold of a copy of Music-X from eBay, it cost us less than a fiver. The particular disk we bought was originally a free cover disk from Amiga Format given away back when Music-X was at the end of it’s commercial life in April 1994. 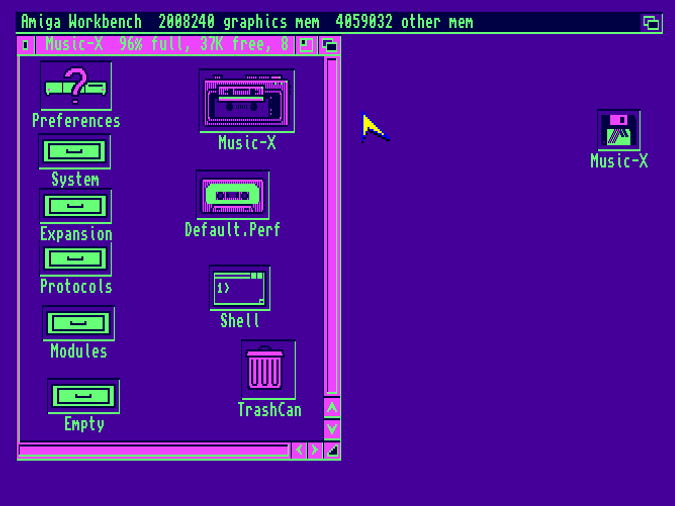 We used the fantastic Kryoflux (check it out, we’ll be running a feature on it soon) disk controller to turn our disk into an adf file suitable for use with the popular Amiga emulator WinUAE. 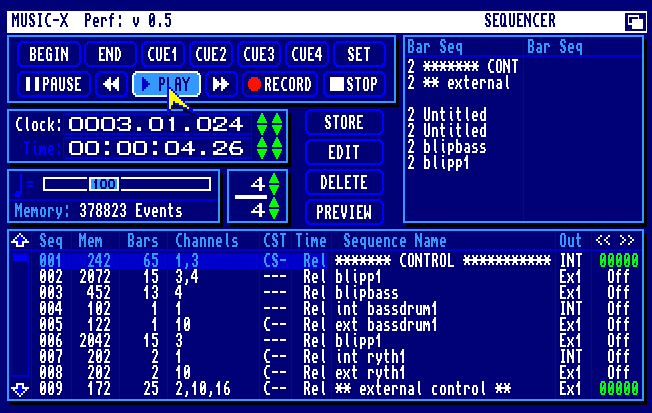 Once started Music-X presents you with the main sequencer screen containing all the required navigation buttons and a list of sequences. 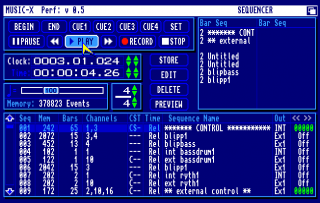 These sequences can be either external MIDI notes or internal samples. 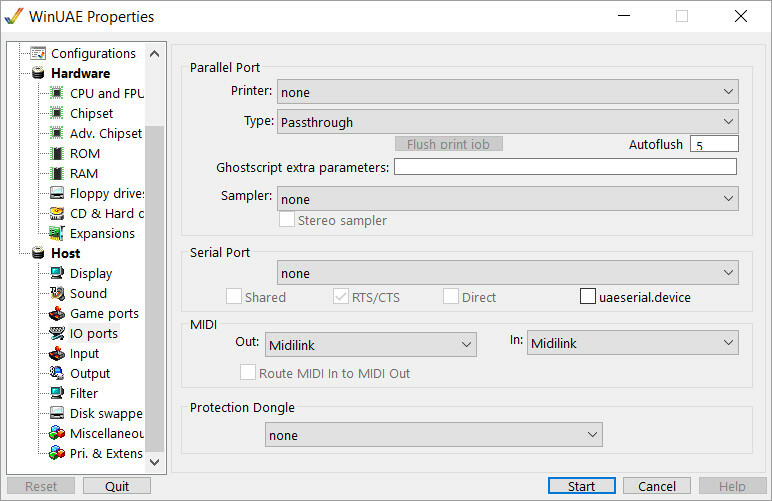 Drop down menus activated by right clicking the title bar give you access to full functionality including file operations, MIDI settings and sample setup. Finally there is a window in the top right hand corner of the screen that dynamically shows you the sequences that are currently active. One of the first things we wanted to do was test out sample play-back by loading up a sample from the world famous (well world famous to Amiga users anyway) ST-01 sample disk. Many of the sounds here will be familiar to Amiga users as they regularly appeared on games and audio demos back in the late 80s. We loaded in the notorious funkbass sample that adorned so many Amiga demos and played it back in all it’s 8 bit glory before sequencing some notes for it to play. That’s all well and good but what about MIDI? How do we get Music-X to send MIDI data from within the confines of WinUAE running on a PC? 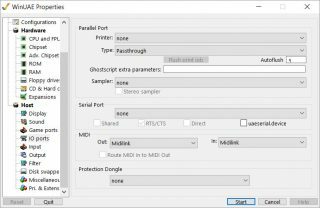 Selecting your MIDI ins and outs within WinUAE. This is actually quite a simple task. Under the ‘Host’ section of WinUAE properties you will find ‘IO Ports’. Click on this property and you will be presented with several options including a section called MIDI, here you can select your MIDI input and output ports. Once selected this allows you to not only play the internal Music-X samples via your MIDI keyboard but also to send out notes from Music-X to play on your external MIDI synthesiser. It may not have the power or ease of use that modern day digital audio workstations provide but it has it’s own simplistic charm. We’ve enjoyed using Music-X again and maybe you’ll here us soon on Top of the Pops…if they ever bring it back.